I’m disappointed with the approach that Diabetes Australia has taken towards this year’s National Diabetes Week campaign. 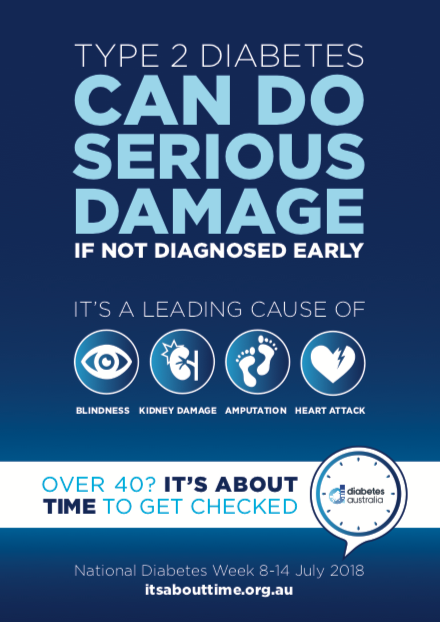 You need only have a read of that poster to see that it paints a great, big sad picture of diabetes. A great, big sad picture of me and the 1.1 million other Australians living with this disease. And yet another diabetes stigma that I will have to combat. Another 280 people will be diagnosed with diabetes in Australia today, and that poster doesn’t give them much hope for a healthy life. Look, I honestly get that type 2 diabetes is preventable. And if there’s something that we can do to reduce it’s impact on other lives, then I’m all for it. 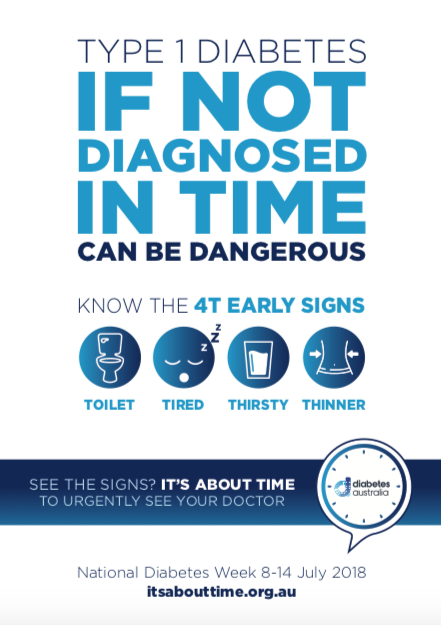 But I think in the midst of this campaign, Diabetes Australia may have forgotten that some of their audience following this campaign are people with already diagnosed diabetes. And as a person with already diagnosed diabetes, I absolutely hate reading such demoralising statements. Diabetes is NOT a burden that I “will have to spend the rest of my life managing 24/7.” Its not a great burden on me, and most certainly not on my family. I can confidently say that I’ve done and achieved everything that I would have done regardless of my diabetes. If diabetes was a burden, I certainly wouldn’t have graduated from uni, travelled, worked and adventured. Hell, how would I even be able to get out of bed in the morning? And when that poster brings up the growing epidemic of diabetes, it just screams of the blame game. It seems to imply that its our fault. That we are doing something wrong. That somehow, I, and everyone like me, are a part of the problem. In the case of type 1 diabetes, I made my message loud and clear in yesterday’s post. There is no definitive cause to type 1 diabetes. Type 1 diabetes is not caused by a lack of exercise, a bad diet or unhealthy lifestyle. Its not my fault. Its not my family’s fault. It’s just another card that I’ve been dealt with to play in life. And in the case of type 2 diabetes, an unhealthy lifestyle certainly isn’t the sole cause either. Things like genetics, family history, age, gestational diabetes and even ethnicity can play a part. And let’s not forget that some of those lifestyle factors are out of our control too. Things like slow metabolisms and actual chronic conditions that inhibit activity. And in the cases where diabetes may be caused by lifestyle factors, playing the blame game does very little to empower the newly diagnosed patient. And playing the blame game doesn’t help them in coming to terms with their diagnosis. And then there’s the lovely list of complications. I’m haunted by the thought of complications. Every time that I’m not feeling right, I worry that maybe I’ve done something wrong. Every time that I see a bad reading, I think that maybe, just maybe, I’ve pushed my body to its limits and caused some kind of irreperable damage. I still get scared to this very day. And I’m in my twenties. What about all the poor type 1 kids out there who have to see these horrible images. What about the poor parents who have to go to bed at night with those horrible thoughts, worrying for their child’s future. I don’t want to hear that I’m going to develop complications. I don’t want to hear that diabetes is somehow my fault. And I certainly don’t want to be painted a great, big sad picture of what my life will not be. In my opinion, there’s a much better way of doing it. Give me a campaign that empowers me to be healthy. Give me a campaign that empowers the whole world to be healthy. A campaign that uses great big words. Words like Conqueror. Warrior. Dominator. Gladiator. Survivor. Show me what a healthy life is capable of. Show me what a healthy life with diabetes is capable of. And make me want to go out there and be as healthy and happy as I can be. HBF Health Insurance in Western Australia have the right idea. They have a fantastic marketing message that goes something like “it’s amazing what a healthy body can do.” Just check out their Facebook page – its flooded with bright, colourful images of healthy people, tips and advice for living well. I would really love to see a campaign like this next year. 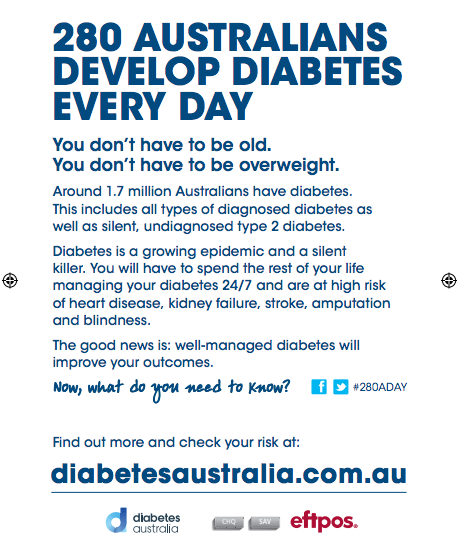 I have the utmost respect for Diabetes Australia, but enough with the scare tactics and blame games. 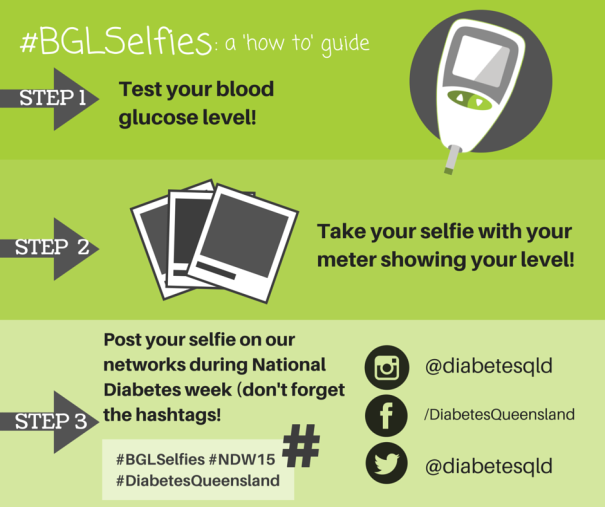 Diabetes Australia’s National Diabetes Week 2015 runs from July 12-18, 2015. To find out more about the ‘280 a Day’ campaign and how you can get involved, click here.